Brian Bolland became the defining DC cover artist of the time after his success on The Killing Joke. British writer, Grant Morrison was born in 1960 to a working class family from Glasgow where his father had become a political activist. As a member of the ‘Committee of 100’ the anti-nuclear group retaliated by producing underground reports. Walter Morrison would take Grant as a decoy provoking his son to kick a ball over the fences of the missile bases. It was here he would witness striking imagery of cardboard coffins in prep for the casualties of a nuclear war – a hidden world that was more than enough to spark the imagination of the young Morrison and along with his father’s own political stance forged a strong, activist voice in his later work. Glasgow’s ties to America are therefore not difficult to see through the US nuclear submarine bases at nearby Faslane and Holy Loch where the US Navy brought American popular culture into Scotland. Morrison has stated that the Yankee Book Store in Paisley may have been the first shop in the UK to sell American comics; stocking up on what was made available to the US Military personnel who were based in Scotland. With the fear of Armageddon it is also of no surprise that Grant Morrison found solace in comic books. With a strong taste for music and fashion, Morrison’s devotion to his mod-psychedelic punk band, The Mixers had waned in the mid ‘80s and therefore began to commit himself more to his writing. Having briefly produced work in the late ‘70s with his Moorcock influenced Gideon Stargrave strip it wasn’t until just after the success of Alan Moore’s Marvelman (Miracleman in the US) that Grant Morrison and artist, Steve Yeowell, made their first impact with 2000AD’s Zenith – a futuristic satire that examined the impact of celebrity culture. With Alan Moore already pond-hopping after the success of Miracleman, his groundbreaking run on Swamp Thing had sparked an interest in British writers and with the popularity of Zenith, it wasn’t long before the headhunters of DC were about to offer Grant Morrison a similar opportunity to dust off one of their lesser known characters. 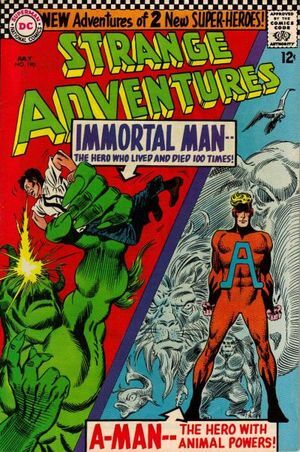 Although Animal Man debuted in Strange Adventures #180 in 1965 he wasn’t given his costume and name until Strange Adventures #190. Created by Dave Wood and influential artist, Carmine Infantino in 1965, Strange Adventures #190 introduced the reader to Animal Man’s strange powers. After caught in the blast of an alien explosion Buddy Baker learns to temporarily absorb the abilities of any animal within close proximity which enables him to fight crime. With his brief appearances during the 1980s; including Crisis on Infinite Earths; the crossover and modern retellings of popular superheroes ushered in the modern age of comic books and an opportunity to rebuild another universe. As one of the more obscure characters of the DC Universe, Buddy Baker and his alter ego, Animal Man had become one of many disposable commodities to throw towards the rise of talented British writers who had emerged during the mid ‘80s. With the reinvention of Len Wein and Bernie Wrightson’s Swamp Thing, Alan Moore’s genius intellect had paved a unique path, not only for Morrison’s Animal Man but also the reawakening of the Sandman by Neil Gaiman. There is no doubt that these two Mages of graphic literature have had a seismic impact on the comic book industry which has remained just as important three decades later. Without delving too much into the contemptuous relationship between these two writers, this essay focuses more on the ‘nature’ of Morrison’s run on Animal Man and why it has remained an important piece of graphic literature in its own right. Morrison’s approach, which becomes more and more apparent as his Animal Man storyline develops, is very similar to Moore’s in terms of the writer’s own belief system and personal experiences of altered states and spirituality. As Buddy Baker’s story begins to elude more and more towards a metaphysical arc of the character, it is often very clear that Morrison was injecting the story with many unconventional concepts that have often been referred to as shamanic. 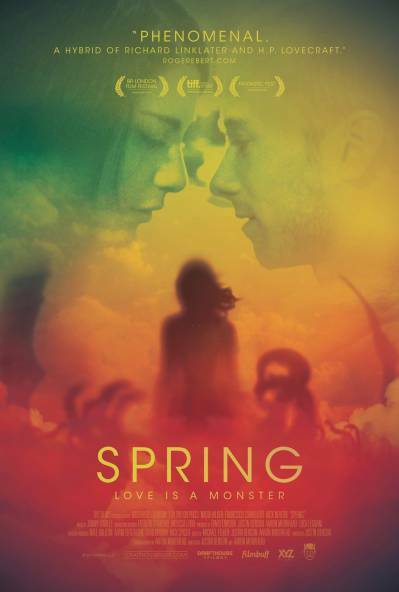 Where Moore’s version of Swamp Thing travels a more two and even three dimensional plane through space and time, Morrison attempts to push the narrative further and create planes that not only break the panels of the traditional sequential art form but also the very boundaries of reality. 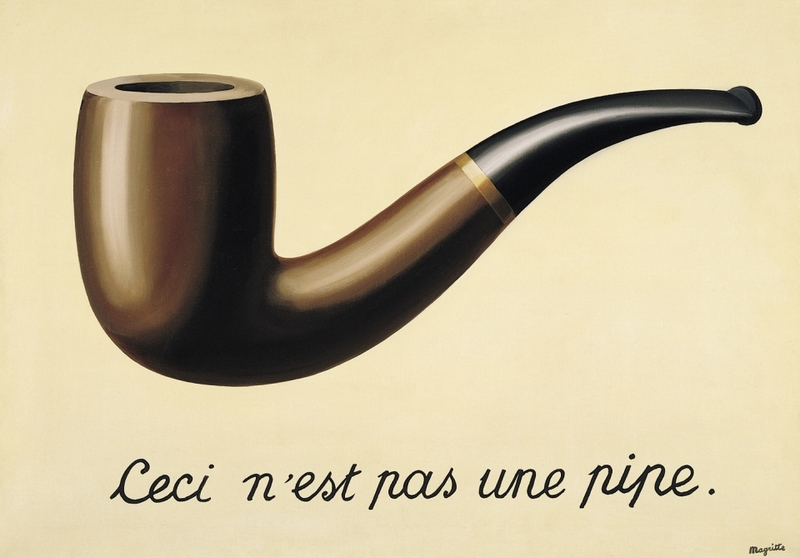 René Magritte’s Ceci n’est pas une pipe (‘This is not a pipe’). Magritte’s surrealist and thought-provoking images challenged observers’ preconditioned perceptions of reality. In order to understand the subgenre of metafiction, Morrison’s Animal Man takes you through Buddy Baker’s own growth in human consciousness that explores an abstract ideal of a spiritual world beyond the physical – a key concept that deals with such metaphysical issues. During the course of the story Buddy gradually embraces and masters his animal instincts and forges his ability to his advantage. As his quest becomes more and more challenging through an increasing abstract perception of his world, it is here that Morrison’s narrative is one that is saturated in familiar motifs that are built on the importance of semiotics. This is where Animal Man travels a more cerebral plane; reminiscent of a number of religious beliefs and philosophies. 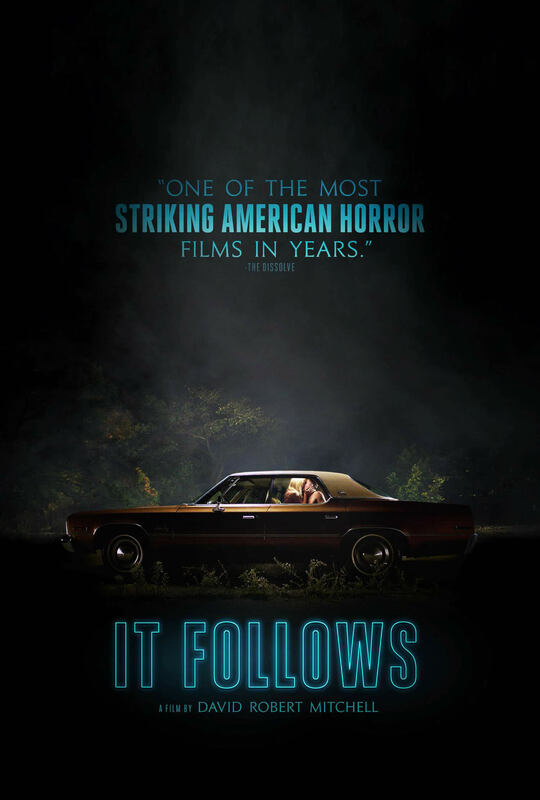 As already referred to, Morrison is somewhat of a shaman himself and well known for traversing particular planes of existence and more than often are threaded into his multilayered storylines. Animal Man’s quest is somewhat reminiscent of enlightenment where only the truly wise may reach the borders of their own existence and transcend to a higher plane. Animal Man #26. Penciller, Chas Truog helped bring to life the many layers Grant Morrison applied in his scripts. In his final issue as writer, Animal comes face to face with his creator. When Buddy Baker questions his reality; Morrison goes on to explain how, ‘You’re more real than I am’ which alludes to Hindu mysticism where the soul reincarnates on earth over and over again until it is perfected and therefore reunites with its Source. 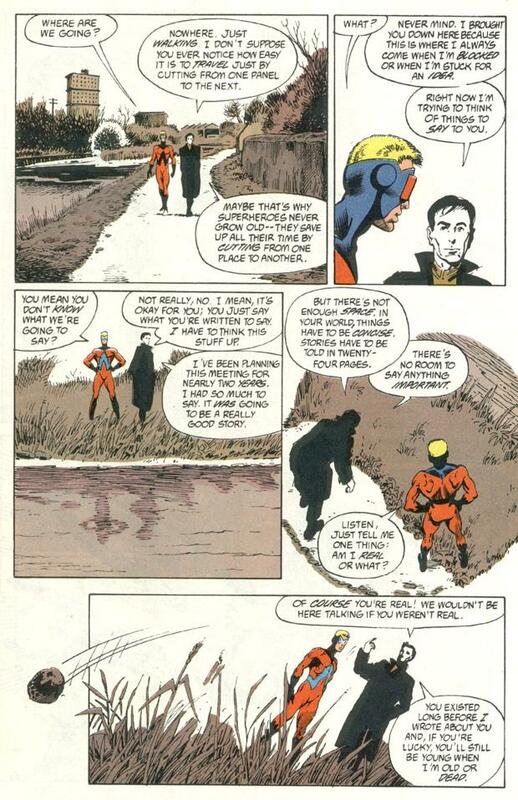 With this in mind there is a karmic philosophy and undertone that constantly drives the narrative of Animal Man. It is in these metaphysical states that both Moore and Morrison, through their own controversial beliefs and British cynicism, helped reinvent the comic book; elevating it beyond ‘puerile’ and ‘juvenile nonsense’ left over from the post war era. Both writers’ leanings towards philosophy and more implicit methods have helped maintain a multi-layered approach to their stories. Both intended to break boundaries in storytelling and through Morrison’s emphasis on the existence of fiction and reality the fourth dimension becomes all the more accessible as he blurs the line between creator and creation; the idea and the final product. Some would argue that any neglected superhero could have been used to experiment on with these concepts but the mere idea behind the metaphor of man’s relationship with animals can be a similarly cruel one and during the final scenes of the story, Morrison’s message becomes all the more clear and helps to justify why Buddy Baker has been chosen. 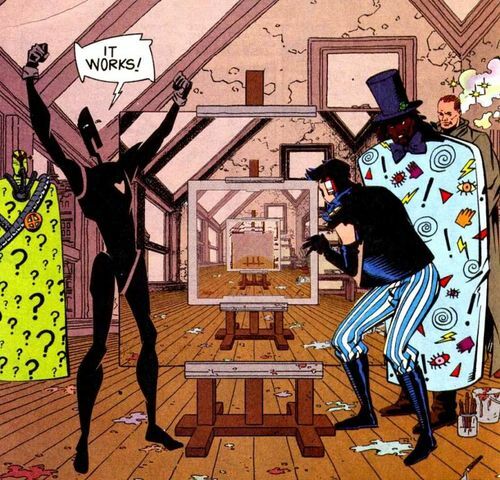 In issue #27 of Doom Patrol, The Painting that Ate Paris, Morrison creates one of the most bizarre and surreal stories that deals with a mysterious unnamed piece of artwork that has many levels. The power of the artwork goes beyond mere appreciation and is said to absorb anyone who gazes upon it. While writing Animal Man, Morrison’s other DC title, Doom Patrol also delved into the use of meta-fiction, albeit more of a parody of popular titles such as the Uncanny X-Men and The Punisher. 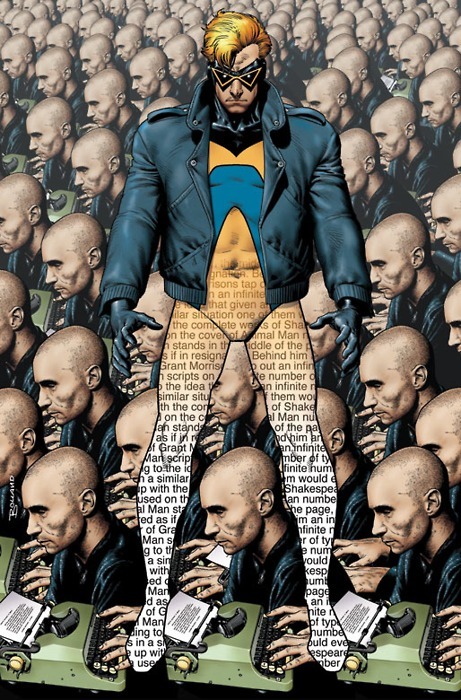 Much like the discarded Animal Man, the characters of Doom Patrol were relaunched post Infinite Crisis with Morrison taking over the writing from issue #19. As the antithesis to Marvel’s X-Men, Doom Patrol would explore the truly uncanny nature of a group of outcasts that literally painted a rogues gallery of surreal villains centred around the Dada movement and the free association of William S. Burroughs’ cut-up techniques. Morrison not only delivered a unique vision but also pushed how far the written word could be fragmented; forcing the reader to analyse and therefore decipher what characters such as antagonists, the Scissormen were saying. El Ingenioso Hidalgo Don Quijote de la Mancha (The Ingenious Gentleman Don Quixote of La Mancha) by Miguel de Cervantes – more popularly known as Don Quixote demonstrates a classic example of metafiction with the central characters spiralling madness highlighted by his self awareness within the narrative. Although often associated with Modernist movements; particular tropes of metafiction can be linked as far back as Homer’s Odyssey, Chaucer’s Canterbury Tales from the 14th century and the later work of Laurence Stern’s Tristram Shandy in 1756 where all these stories contained elements of self-reflexive devices. It was therefore here, within the narrative, that characters became aware of their own existence and forged a literary device that first attempted to break the fourth wall. This device has been used to delve much deeper into the narrative and, from an analytical point of view, this self-conscious method is primarily used to help highlight the work’s significance as an artefact in itself that primarily provokes a number of questions about the relationship between fiction and reality. As a clear analogy; the method could be compared to theatre where it becomes more difficult for an audience to separate themselves from the performance and it is within the words on the page that metafiction reminds the reader they are aware of reading a fictional account. In Miguel de Cervantes’ seminal masterpiece, Don Quixote the use of metafiction was written to great effect through its use of realism and became a benchmark for any novelist who used this more self-conscious process in their writing. It could be argued that realism and metafiction are one in the same and simply another technique in parody to help highlight the zeitgeist of the time and force the reader to reflect on the world around them and, in turn, themselves. Don Quixote is metafiction because the central story highlights the nature behind the method of fiction through its own procedures and assumptions; yet Cervantes still managed to build a world that balances the fantastical element by delivering it as a state of mind and therefore is accepted more by the reader. In 1970 the writer and philosopher, William H. Gass first coined the term ‘metafiction’ in an essay; later collected in Fiction and the Figures of Life (1983). Gass’ interpretation can simply be summarised as ‘fiction about fiction’ and therefore it would be easier to label Don Quixote as a ‘book about books’. Within Cervantes’ novel the multiple use of authors develops an awareness in how the name and image of the original creator influences the meaning behind the story. 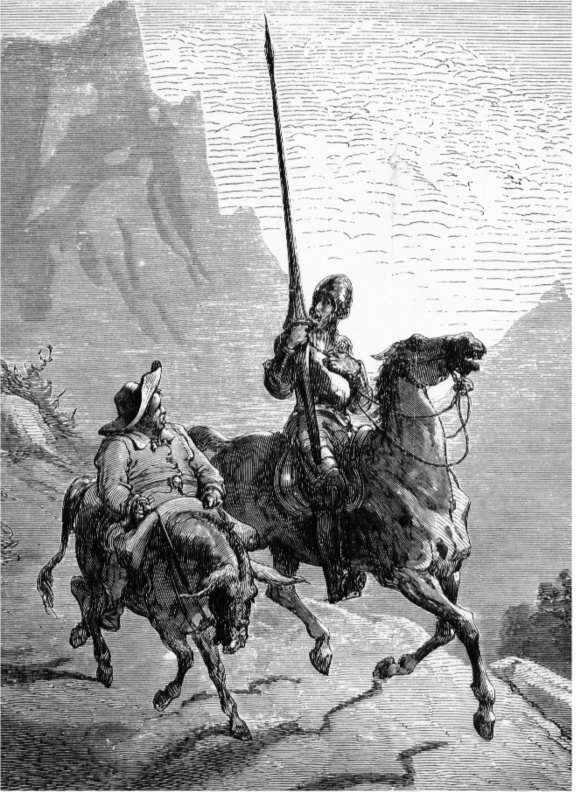 It is only in the opening prologue that Cervantes’ friend advises him on how to make the book, Don Quixote, resemble other tales of chivalry and then later, during further inquisition of Don Quixote’s own tomes, they discover Cervantes’ first novella, La Galatea and deem it worthy of existence. All the while, various other characters and authors within the text discuss processes, attitudes, history and social circumstances and even Cervantes himself; and as Quixote continues through the story it becomes more and more clear that the books are the very crux of his madness. As well as his influence on H.P. Lovecraft, HBO crime drama, True Detective tantalised fans with references to Robert W. Chambers’ classic collection of stories. 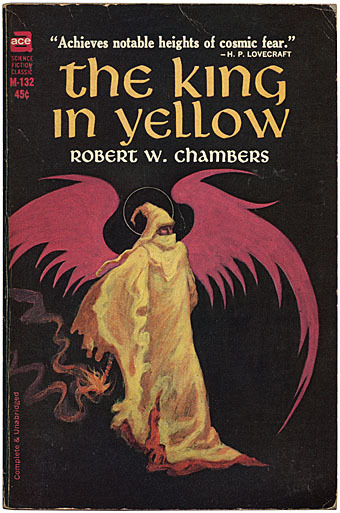 In 1895, Robert W. Chambers’ The King in Yellow delivered a series of short stories centred around a forbidden play which induces despair and madness in those who read it. Although the central characters are not self-aware there is a fabricated myth of a story within a story that would go on to inspire the delirious works of H.P. Lovecraft. With his Cthulhu mythos, Lovecraft had created a cosmic deity that had become a nightmarish source of anxiety for all humanity and in the context of its own mythos, had become the subject of worship by a number of religions around the world. This malevolent entity was depicted as the amalgamation of a giant octopus, a man and a dragon; hundreds of meters tall with human appendages and a pair of crude, wings on its back – a nightmarish leviathan that harkened back to creatures of ancient legend. Here, Lovecraft was building his own world to explore where, often, it could be difficult to separate the writer from his own fiction. 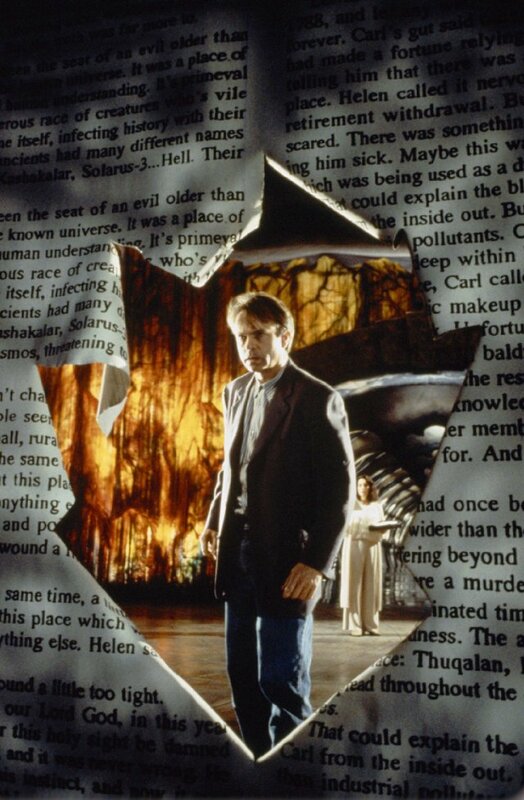 John Carpenter’s In the Mouth of Madness (1994) is a direct homage to Lovecraft and a prime example of metaphysical horror. With obvious rifts of Lovecraft in his remake of The Thing – John Carpenter plunged several more layers with In the Mouth of Madness which made good use of homage to build on its metafictional storytelling. From Michael Ende’s The Neverending Story to Stephen King’s The Dark Tower series, readers have witnessed central characters pulled into the very worlds they read about and, in King’s instance, even write themselves into their own fantasy. However dark or enlightening seminal literature has been; it is clear that the greatest works transcend time because they have resonance. If there is nothing entertaining at its core then it will not last and in a day and age where the internet its digital content seems to rule; now, more than ever, a metafictional state is the perfect platform to engage new readers and build on intellectual properties. Comics and the use of sequential storytelling have often been frowned upon by the literary circle yet the 21st century has embraced this medium more than ever. Since the mid ‘80s the comic book has attempted to reinvent the medium, particularly the perception of how the superhero functions within a modern world. Although Frank Miller was to break new boundaries with The Dark Knight Returns, both Batman and Superman were able to paint a very clear picture of Regan era America that helped to connect with a wider audience. However, it was in the pages of DC’s more obscure title, Swamp Thing that Alan Moore had already been setting the precedence in how to delve much deeper into a fictional world. In true, gothic fashion, Moore’s stories were rich in texture and romanticism and it was shortly after the title’s success that DC sought a similar approach in Grant Morrison’s treatment for Animal Man that began to set the foundations for DC’s imprint, Vertigo.